In our game (Dungeon Boss), without changing this global, our Mono reserved heap size is 74.5MB in the first level. Setting this global to 16 at the dawn of time (from our main script's Start() method) reduces this to 61.1MB, for a savings of ~13.3MB of precious RAM. The collection frequency is increased, because the Mono heap will have less headroom to grow between collections, but it's still quite playable. Bumping up this divisor to 64 saves ~23MB of RAM, but collections occur several times per second (obviously unplayable). // The default divisor is 3. Anything higher saves memory, but causes more frequent collections. Just remember, if you change this setting LibGC will collect more frequently. But if your code uses aggressive object pooling (like it should) this shouldn't be a big deal. Also note that this global only impacts the amount of Mono heap memory headroom that LibGC tries to keep around. This global won't help you if you spike up your Mono heap's size by temporarily allocating very large blocks on the Mono heap. Large temp allocations should be avoided on the Mono heap because once LibGC gets its tentacles on some OS memory it doesn't ever let it go. IL2CPP uses around 30-39MB more RAM for our 32-bit build. We've been struggling with memory on iOS for a while (as documented here). I honestly don't know where to find 30MB more RAM right now, which means our title on 512MB devices (like the iPhone 4s and iPad Mini) is now broken. Crap. 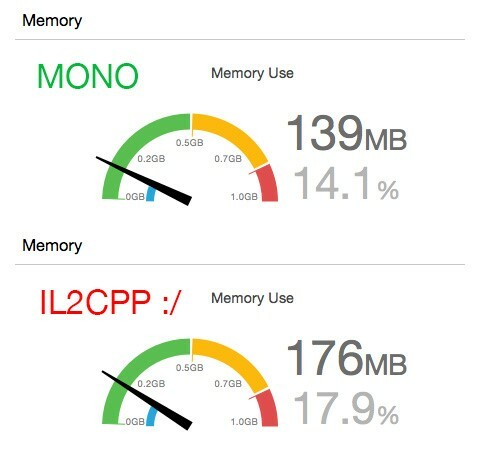 The additional memory utilized by IL2CPP builds vs. the previous Mono-AOT approach is ~10MB for our code with an empty scene, and >30MB with everything running. We've also tested the latest patch, Unity 4.6.5p4 (which is supposed to use less memory on iOS) with the same results.